"Create connections and study Torah, because Torah is acquired through friendship." 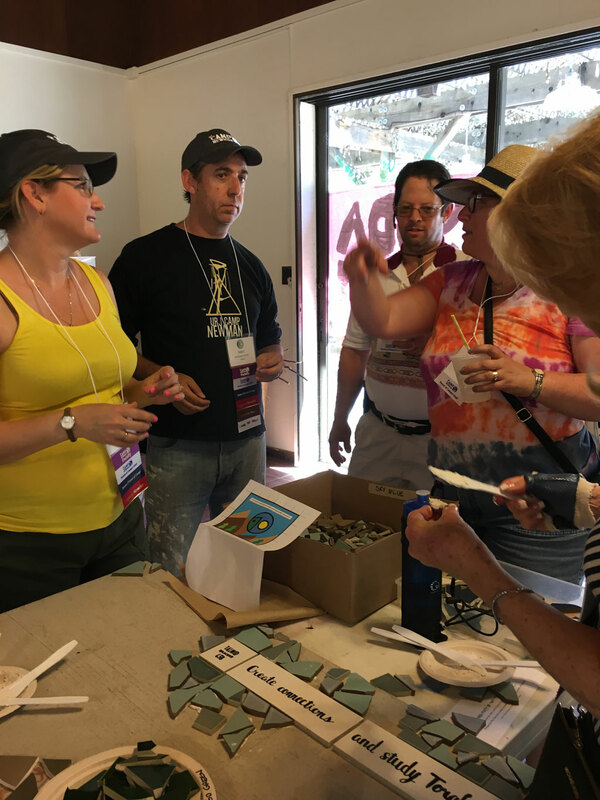 What fine words to sum up the experience of Jewish summer camp – a place where we live Jewishly, where we make new friends, and gain knowledge (and have fun) together. 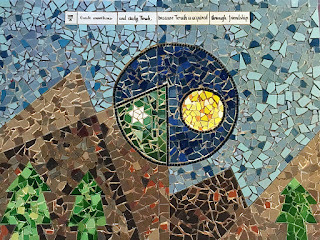 They are the words at the top of the new mosaic we made at camp this summer at the 70th Anniversary Celebration of West Coast Jewish Summer Camp, held at URJ Camp Newman in July. The original logo as used in promotional materials. 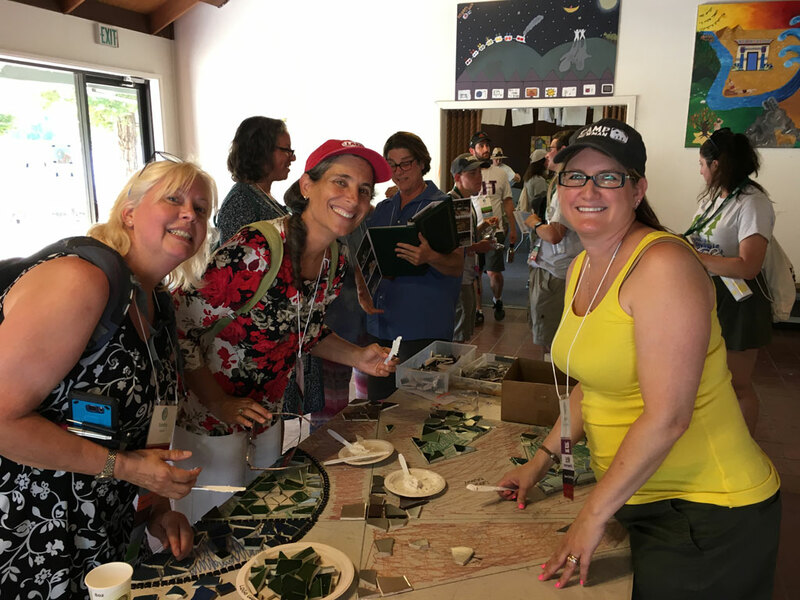 Sunday, July 16, hundreds of people convened in Santa Rosa at Camp Newman to celebrate 70 years of west coast Jewish camping – from Camp Saratoga to Camp Swig to Camp Newman. 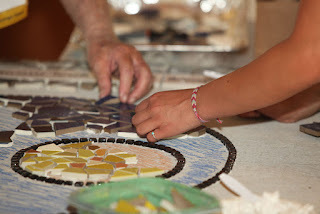 It was an unforgettable day at our home away from home, with singing and dancing and reconnecting... and one more big thing: making a 24-square-foot mosaic in just four hours! My wife (Rabbi Shawna Brynjegard-Bialik) and I were asked by camp to lead an community art project: making a new mosaic for Camp Newman that would commemorate the 70th celebration, and getting the hundreds of celebrants joining us at camp to all put a piece (or two or three) in. And we did it! I designed the original logo for the celebration, and we designed the mosaic to build that logo into a full camp landscape – along with input and support from camp artists from over the decades. Rabbi Shawna with the incredible and indefatigable Charles Yoakum and Max Winer! We spent most of the morning before everyone arrived at camp getting it all set up, and then over the course of four hours we worked as hard and as quickly as ever we have on any mosaic, which is why we took to calling it "extreme mosaic-ing." 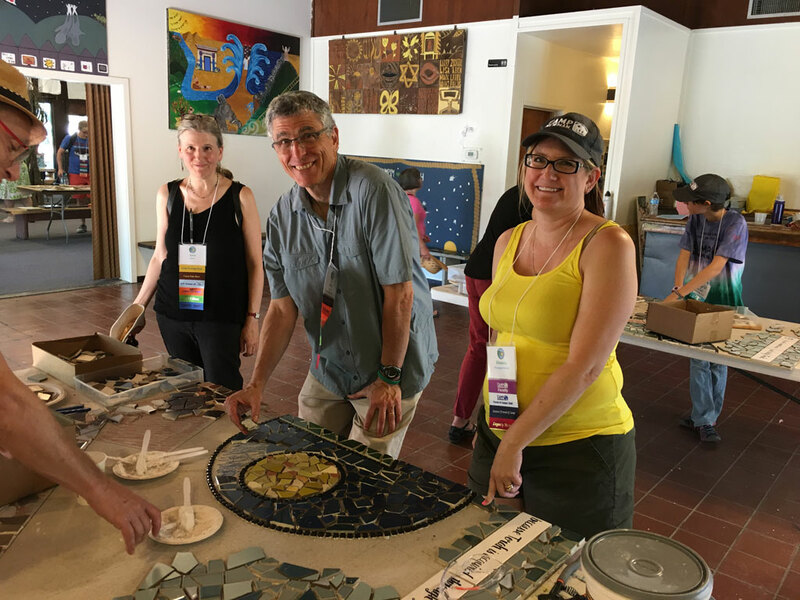 We were pleased to welcome Rabbi Rick Jacobs, president of the Union for Reform Judaism, who joined us to place a few pieces in the mosaic as well. 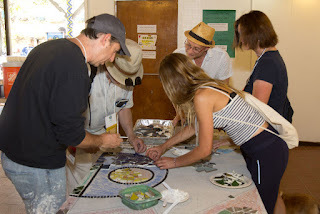 And the mosaic was complete before the end of the celebration! Here's a mock-up we made in Photoshop; we promise to share photos of it in its camp home as soon as its up. Big thanks to Heath Ceramics and Tile Clearance, Inc., who both contributed tile to the camp so we could get this done. Want information on how you can bring me and Rabbi Shawna to YOUR community? 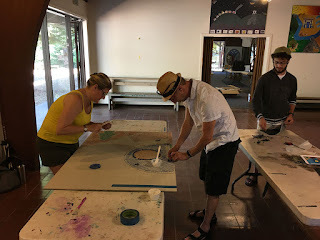 Check out our new website: www.PaperMidrash.com.